This is clear fused quartz glass doped with cerium to block ultraviolet. This glass block all vacuum ultraviolet, nearly all UV-C, UV-B and emit minimum UV-A. It is an ideal material for lamps requiring maximum visible light and to avoid UV exposure to people and materials. 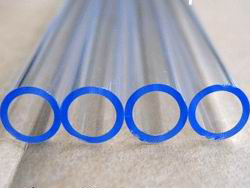 UV tubing becomes more and more popular in the market for the unique characteristic. Now days, more and more cars are using plastic front windows. The plastic front windows may be discolored under the exposure of deep ultraviolet. The automobile lamps made with UV Block quartz glass tube can stop deep UV exposure to plastic windows to keep the windows out of becoming “yellow”discoloration and emit super “white” visible light at the same time. It is ideal for automobile lamps. As for light, the shorter the wavelength, the big the energy. The wavelength of Vacuum UV, UV-C, UV-B are shorter, so they have bigger energy. UV-C can do great damage to exposed cells. UV-B are hazardous and are largely responsible for sunburn. UV-B is also largely blamed for a kind of deadliest skin cancer "malignant melanomas". This quartz tubing can block nearly all short UV wavelength which is an ideal material to make lamps for UV protection purposes. We can supply UV-1 ~ UV-5 , with different features.